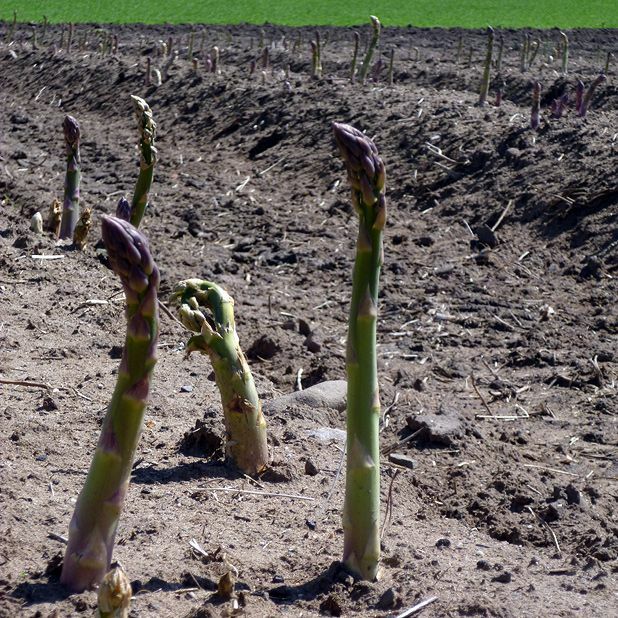 In 1985, Sandy Pattullo’s New Zealand cousins told him asparagus was the easiest thing they grew. With such an endorsement, he began expanding his asparagus crop from a garden vegetable patch to several acres. In practice, Patullo found growing asparagus at his Eassie Farm near Glamis hard graft. He remains one of only a handful of Scottish farmers growing the vegetable in this chilly climate. With ten acres, Eassie Farm is one of the country’s largest, and arguably most successful, operations. It wasn’t always so. Pattullo remembers the reaction from his industry contacts when he first started selling his asparagus: ‘I rang a wholesaler I knew back then and he said: “Asparagus? Neeps and tatties, that’s all I need!”’ So he was forced to turn to the fruit markets, and accept whatever price they offered for his valuable crop. ‘Sea kale would have been in all the walled gardens of the 19th century,’ Sandy Pattullo explains, ‘but it fell out of use in the twentieth.’ When he started growing it in the 1980s, there was one other UK sea kale farmer. Nutty, sweet and succulent, the shoots are labour intensive and expensive to grow. Supplying supermarkets ‘killed’ the other UK grower: ‘Every time he sent produce over, the supermarkets said he had to do it cheaper,’ says Pattullo, who turned down early offers to supply the big stores in favour of London’s Covent and Borough markets, and direct relationships with restaurants. Overharvesting of wild sea kale in the 19th century led to a total ban on picking it, and without ‘thongs’ cut from the roots of existing plants it must be grown from seed, a process that takes years. If Eassie Farm ended production, it would be difficult for other commercial growers to begin from scratch. Despite sea kale being a native British vegetable, to try it most people will need to make a very seasonal trip either to Eassie Farm, or to a handful of restaurants that make use of it. London’s River Café takes several boxes a week during the short season, generally January to March, and in Scotland you’ll find it on menus at The Kitchin in Edinburgh, Perthshire’s Monachyle Mhor and Little’s Restaurant in Blairgowrie. A boutique hotel hideaway and internationally regarded restaurant in an 18th-century rural farmhouse and steadings, farming their own land and cultivating a kitchen garden.